This fine European Art Nouveau style antique pearl and diamond necklace has been crafted in 14ct white and yellow gold. The articulated necklace has three main components: the uppermost setting has an iconic Art Nouveau style pierced and millegrain decorated frame embellished with four Old European round cut diamonds and a feature pearl. Six more pearls ornament the central portion of the linear style vertical link, which is accented at either end with Old European round cut diamonds set in subtle relief to the domed, millegrain decorated terminals. 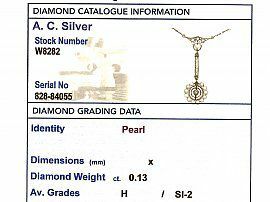 The articulated, target style drop design of the antique pearl and diamond necklace is embellished with a central collet set Old European round cut diamond, encircled by two concentric bands, and an outer wire set border threaded with twelve, freely moving 3mm pearls. This border is accented with a collet set Old European round cut diamond at the junction with the vertical link. This impressive antique pearl and diamond necklace is suspended from the 40.5cm/16", 14ct white gold trace chain via two integrated loops at each end of the Art Nouveau style setting. 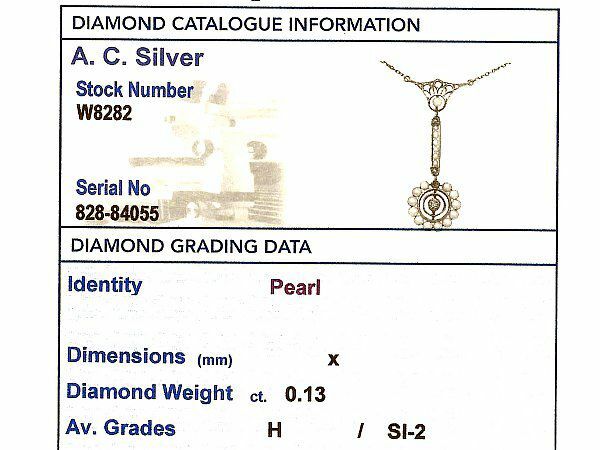 This early 1900s necklace is supplied with an independent diamond grading report card. This necklace has been independently tested using state of the art technology (Niton XL2 Analyzer) and verified as 14 ct gold. This impressive antique pearl necklace is fine quality, set with very high colour graded diamonds and fine seed pearls. The pearl and diamond necklace is a good gauge of gold and is in excellent condition. Total length of drop 4.80cm/1.88"
Width across upper setting 2.00cm/0.78"